The 1968 Golden Nugget Special or Golden Nugget Limited Edition Mustang was an Oregon/Seattle promotion which took a 1968 hardtop and offered it in Sunlit Gold (color code Y, usually followed with a "5" to indicate the black hood, and special order number 1111 after the 74 DSO found on the door data tag) although any of the standard or special Mustang colors could be ordered. Also with this package came the louvered hood with black painted inserts, black vinyl top, a black interior, and featured unique golden plaques on the dashboard with the original owner's name engraved. 481 Golden Nugget Limited Edition Mustangs were actually produced of the 525 scheduled to be offered through the promotion. Scott Rear of Pitt Meadows, BC, Canada sent us this photo of his Sunlit Gold 1968 Golden Nugget Special Mustang hardtop with its original 289ci 2V V8 engine. This original Golden Nugget Special was purchased from Perry Morrell Motors which used to be in Silverton Oregon. Scott says, In the process of restoring her now. I am looking for images of the dash plaque that came with the car so I can reproduce one. The vinyl roof has been removed in the pictures. 525 of these cars were built and sold in the Seattle area and came with 289 cubic inch 2V V8 engine, C4 automatic transmission, louvered hood, black stripes, black vinyl top, black interior, and featured unique golden plaques on the dashboard with the original owner's name engraved. Check out the ad I found in the January 26th, 1968, edition of the Seattle Times. Corporate Yellow 1968 Mustang Gold Nugget Special hardtop with a 289 cubic inch, 4 barrel V8 engine. This was one of the 525 Gold Nugget Special cars ordered in the Seattle and Oregon areas. Most of the cars came in Sunlit Gold (color code Y) which some call Anniversary Gold (and think its a darker gold but we have no idea other than the ad from 1968 which says its Sunlit Gold), although all the standard and special 1968 colors were available. As part of the Gold Nugget Special package came a black vinyl roof, blacked out hood stripes (delete when restored) with louvers, and a golden dash plate with the owners name. Sunlit Gold 1968 Gold Nugget Special Mustang hardtop which was only sold in the Seattle/Oregon area. We are still working to determine if a special darker version of Sunlit Gold called Anniversary Gold was used, but the ad from 1968 says Sunlit Gold. Other standard options in the Gold Nugget special package was a 4 speed manual transmission, power steering, AM radio, center console, deluxe seat belts, black vinyl roof, performance tires, wheel covers, louvered hood, and front fascia integrated turn signals. 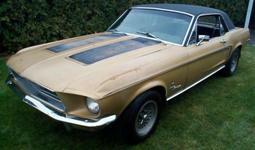 This is a special edition Sunlit Gold 1968 Mustang Golden Nugget Special hardtop. It has the original 302ci V8 and an automatic transmission. The owner tells us, "The 1968 Golden Nugget Special or Golden Nugget Limited Edition Mustang was an Oregon/Seattle promotion which took a 1968 hardtop and offered it in Sunlit Gold (color code Y, usually followed with a '5' to indicate the black hood, and special order number 1111 after the 74 DSO found on the door data tag) although any of the standard or special Mustang colors could be ordered. Also with this package came the louvered hood with black painted inserts, black vinyl top, a black interior, and featured unique golden plaques on the dashboard with the original owner's name engraved. 481 Golden Nugget Limited Edition Mustangs were actually produced of the 525 scheduled to be offered through the promotion. More pictures are available to the potential buyer." Advertisement for the 1968 Seattle area Golden Nugget special Mustang we found in the January 26th, 1968 edition of the Seattle Times. We found several of these advertisements in the January and February issues of the Seattle Times newspaper to promote the 525 specially painted and optioned Mustangs. This advertisement says, "Exclusive for this area only! Specially ordered, specially painted Mustangs, each with a golden plaque for the dash panel bearing the customer's name. Sunlit gold color, with black vinyl top, black hood panels. Black stripe. Whitewalls. Wheel covers. Plus all the better ideas that make Mustang America's favorite, most imitated sports car. More Mustang than ever for '68." This ad also shows what the golden dash plate looks like (of course in black and white and in a different scale...) We think this advertisement was payed for by Ford since it has no local dealership listed, which may mean that the Golden Nugget Special promotion was a Ford promotion rather than a group of dealers. Another indication is the special order number of 1111 which appears on the door data tag of each car after the DSO code of 74 indicating the Seattle area. This 1111 code appears to be special since it was also used in 1966 for the 50 special limited edition Millionth Anniversary Mustangs. I photographed this Sunlit Gold 1968 Golden Nugget Special at the 2011 Mustang Round-up car show in Bellevue, Washington. It was actually one of two Golden Nugget Specials at the show. 525 of these were built for a special promotion in the Seattle area. Included in the package was a golden plaque for the dash panel bearing the customer's name, Sunlit Gold paint, black vinyl top, black hood panels, black stripe, whitewalls, and sport wheel covers. Checkout the Seattle Times advertisement I found on this special promotion. This is a Sunlit Gold 1968 Mustang Golden Nugget Special coupe. The Golden Nugget Mustangs came with the blackened hood louvers, black side C-stripes, and black interiors. They also came with a plaque on the dash with the owner's name. This one does not have the plaque.